This is the second book in the Island series, which I'm reading aloud to my younger daughter. Miraculously, all the kids wind up on the same island. Will regains consciousness, but he is suffering from short-term memory loss and doesn't recognize any of the others. He thinks they are still in Guam, and he doesn't remember being aboard the Phoenix or anything that took place once they were at sea. Frightened, Will takes off into the jungle on his own. Luke, Charla and Ian are reunited with Lyssa and J.J., and the group tries to find Will. When the kids finds a plane on the other side of the island, they are elated at the prospect of being rescued and returning home. However, their would-be rescuers are actually criminals and the kids witness a murder. Thankfully, the thugs don't realize yet that they are not alone on the island and the kids have to remain hidden to keep safe which doesn't help their chances of being rescued! The title of this installment is definitely fitting, because the kids have to learn how to survive on the island. They need to set up a shelter and find food, yet remain under the radar so that they aren't discovered by the men on the other side of the island. Ian's addiction to the Discovery Channel comes into use time and again, and the group looks to him for advice with his fountain of knowledge. J.J. drives me crazy! He still thinks that everything that has happened has been an elaborate set-up by CNC. I guess it's his way of dealing with reality, which is to NOT deal with it! 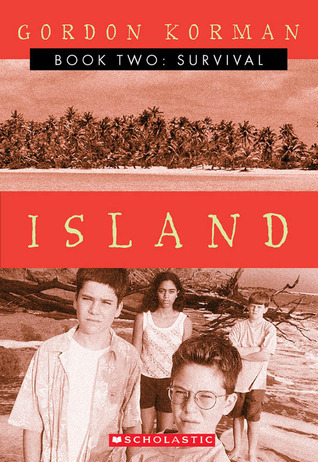 I'm looking forward to seeing how the kids get off the island in the trilogy's conclusion, Escape.